(Papers from the Fifth Annual Conference on Consumer Satisfaction, Dissatisfaction and Complaining Behavior. "Equity and Disconfirmation Perceptions as Influences on Merchant and Product Satisfaction"
"Perceived e‐service quality (PeSQ): Measurement validation and effects on consumer satisfaction and web site loyalty"
"STUDY OF THE IMAGE OF TOURIST DESTINATION AND THE GLOBAL PROCESS OF SATISFACTION: ADOPTION OF AN INTEGRATIVE APPROACH"
der Markt, June 1998, Volume 37, Issue 2, pp 83-101. Journal of Hospitality & Tourism Research, 2013. A New Product Purchase By Mail Order." 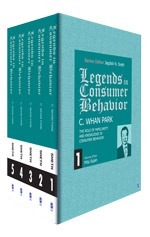 Advances in Consumer Research, 1980, Vol. 7.
ed. Jerry C. Olson. Ann Arbor, MI: Association for Consumer Research, pp 650-654.